Café Casino is definitely a newcomer to the casino industry, there is no denying that. Usually, such newness would be enough to scare a lot of customers away, but that is not the case for Café Casino. The fact of the matter is that Café Casino, though new, is one of the best casinos available for residents of the United States. If you have ever played at the Bodog or Bovada.lv casino sites, you will find that Café Casino looks and is set up in the exact same way as the two aforementioned sites. The way the website is organized lends itself to usability as everything—including games—can be found just by utilizing a simple and straightforward drop-down menu. The software utilized functions flawlessly and, to add to that, there are more than 200 games available for you to use. Create an account today and you’ll also be able to claim a FREE $10 chip to use at their casino. For players who have just created an account at Café Casino and would like to make a first deposit, the 500% up to $5,000 welcome bonus is about as good a bonus as you will find anywhere in the industry. As the name implies, your first deposit will be increased by 500%. As a quick example, this means that if you initially deposit $100, you will receive $500 in bonuses and have $600 with which to begin playing. As far as terms and conditions are concerned, you should know that there is a maximum cash out of 5x the bonus and you must satisfy a playthrough requirement of 35x. This bonus is similar to the one mentioned above, however, there is NO maximum cash out. This means that if you run the bonus up to $100,000, all of that money will be yours. The way it works is that your initial deposit is doubled up to $1,000 in bonus monies. So, for example, if you deposit $200 initially, you will be given $200 in bonus monies and have $400 with which to play. The playthrough requirements on this bonus are not as crazy as they are for the 500% bonus. The playthrough amount for this bonus is 25x. Café Casino offers a few other promotions to returning players, however if we are being honest this offering is lacking in a few ways. Café Casino perks is what they call a program that presents you with all sorts of different, well, perks. These include 10% daily cashback, alternating and varying weekly promotions, a weekly prize drawing, and $100 given to you for referring players who sign up, create an account, and deposit. The rewards are nice, but they are not nearly as good as what you will find on some competing casino sites. There are quite a few different software providers that are featured at Café Casino. Among them, you will find that Real Time Gaming and Rival dominate the overall offering. This music to a lot of players’ ears because the two aforementioned software providers have plenty of experience and are generally regarded as being some of the best software providers for casinos that cater to US residents. For some perspective on just how much experience these providers have, RTG has been in business since 1998 and Rival since 2006. This means that there are more than 20 combined years of experience between the two biggest software providers at Café Casino. Under each one of these blanket terms you will find a plethora of games. Naturally, the most games fall under the slots section as there are well over 100 slot games available at any point in time. There is also a wide selection of video poker and some blackjack variations that you might not have ever seen or heard of before. When it comes down to it, the game selection’s expansiveness is made better by the fact that the games themselves function flawlessly. All in all, you will not be disappointed no matter what game you choose to play at Café. 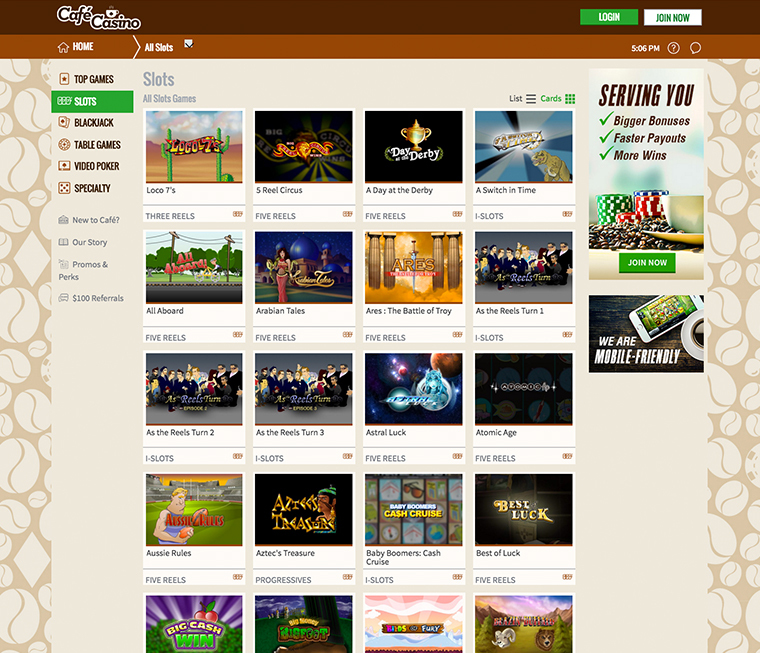 Cafe Casino homepage, complete with easy game selection. Being a casino that caters more to a USA audience, Café Casino is limited in the amount of banking options they are able to offer. Though this is par for the course, do not be fooled into thinking that a small number of options is synonymous with disappointing options. They have done their best to keep up with their times, especially adding Bitcoin as one of their most featured and popular methods to fund your account for the first time. When it comes to deposits, the main options include credit/debit cards – primarily Visa and MasterCard. There are no plans to add other options, like American Express or prepaid-type cards to their lineup. Their credit card options are fine, but remember that both carry nominal processing fees, so be sure to check the site for exact numbers. Cafe Casino also allows customers to deposit using the popular cryptocurrency method, Bitcoin. There are higher limits with bitcoin and it’s hands-down the most secure option on the planet when it comes to online gaming deposit options. Simply enter the amount you want to deposit and from there you will be asked to enter a bitcoin wallet address from Cafe Casino’s cashier backend into whatever bitcoin wallet you use. Submit the deposit and usually within a minute the funds are verified and available in your account. Once you’re ready to withdraw your winnings you can enter your BTC wallet address in the cashier backend, input the amount on the withdrawal and then submit it. Your funds should be available same day, once the withdrawal is confirmed by their support staff. Something we really love about Café is the fact that games can be played anywhere, anytime via just about any type of mobile device. The site functions within your device’s web browser, meaning that games like blackjack and slots are never far away. The software is quite advanced and has a easy to use interface when you’re playing on your favorite smartphone or tablet device. All in all, we would have to say that Café Casino is up there with the best. Of sites able to cater to a US audience, there is not much that is lacking. Though we would like to see a more distinct and rewarding VIP program, the nonexistence of this does not detract from our overall opinion of the site. Going forward, we envision that the future is bright for Café. Sign up at Cafe Casino and claim your 500% bonus before it goes away!